In the orphan world system that we live in, we find our identity in the things we do and what we possess. That is why there is such an emphasis in life to climb the corporate ladder, acquire as many possessions as you can, etc. The more we achieve, the better we feel about ourselves. On the flip side, the more we fail, the worse we feel about ourselves. This kind of motivation leads to a life that not only has lots of ups and downs, but is a very tiring way to live. The more that your identity is directly related with your performance, the less secure you will be in life. After all, what will happen if you cannot perform any longer? Who are you then? Are you less valuable? Are you less lovable? What happens if an economic catastrophe wipes out all your possessions? What happens as gravity sets in as you grow old and you no longer have the perfect physique? Who are you then? I believe that even the very thought that some of these things might happen, can cause many people to live a life of fear because they believe that both their happiness and identity are conditional. We may be loved by the world as long as we can keep up appearances, but what happens when the time comes that we stumble and fall? What happens when we fail to live up to the expectations of other people? From a Christian context, what happens when we fail to live up to the expectations of church life? Are we any less loved by God? Of course the right answer is that we are loved by God no matter what we do. That His love for us is not based on our self effort, but on what Jesus did on the cross when we were powerless to do anything about it (Romans 5:6). While most believers know this to be true on one level or another, there are still remnants of an orphan belief system in our heart that looks to our works to establish our identity rather than to God. Now before the feast of the Passover, Jesus, knowing that his time had come that he would depart from this world to the Father, having loved his own who were in the world, he loved them to the end. 2 During supper, the devil having already put into the heart of Judas Iscariot, Simon’s son, to betray him, 3 Jesus, knowing that the Father had given all things into his hands, and that he came from God, and was going to God, 4 arose from supper, and laid aside his outer garments. He took a towel, and wrapped a towel around his waist. 5 Then he poured water into the basin, and began to wash the disciples’ feet, and to wipe them with the towel that was wrapped around him. Jesus knew that He was the beloved Son of God. He knew that His Father had given all things into His hands. Jesus knew that He came from God and that He was returning to God. It was this revelation of who He was that defined Him, not what He did. Because Jesus was the Son of God, He could do anything. He could heal the sick, raise the dead, and yes, He could even wash His disciples' feet. Nothing that He did could ever compare with who He was though. 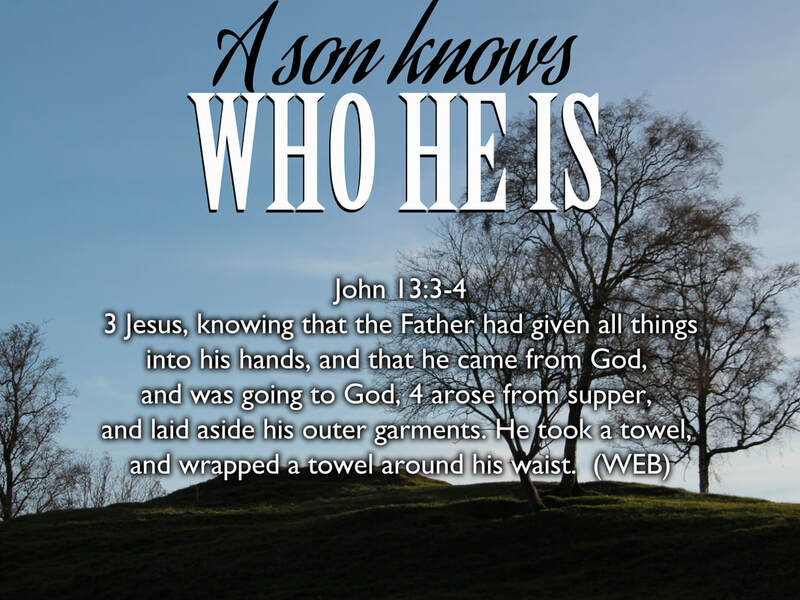 After all, He was the beloved Son of Almighty God! The good news of the gospel is that we have been given the same Spirit of Sonship (Galatians 4:6-7) that our Elder Brother walks in! The truth that will set us free is knowing this to be our reality... We are no longer living separate from Him but have been joined with Him in all His glory (Romans 8:17) because we are His co-heirs. That is why Paul wrote in Colossians 1:27 that the mystery of the ages is simply 'Christ in you the hope of glory'. If we really know this in our inner man, the revelation of sonship will be enough in the midst of a broken world system that wants more from us. Sure, Jesus told us that we would do greater things than He did because He was going to His Father. But even the greatest of all achievements this side of heaven will pale in comparison to us simply being called the children of God (1 John 3:1). My prayer today is that we would all know that our identity in Christ will never be defined by what we do or what we don't do. Our identity is not determined on how much we work, how much we achieve, or how much we sacrifice. Our God given, unshakeable identity was secured for us when Jesus defeated death, sin & Satan on our behalf and invited us to join Him in His union with His Father (John 17:23). May the revelation of God's great love give you courage to simply be who Papa created you to be! Whether that is doing great exploits in the Kingdom or having a nap. May you carry within your being the knowledge that you are a much loved son or daughter to Almighty God... just like Jesus is (Romans 8:29). May this identity be enough even in the midst of a world (and sometimes a church culture) that demands more from you. It is my hope and prayer that the compass of all our hearts would always be calibrated to the love that God has for us. Whether we achieve or we fail, whether we work or whether we rest, may we all know that God's love will never ever change towards us and our identity as Papa's beloved children is secure forever. 1 If I speak with the languages of men and of angels, but don’t have love, I have become sounding brass, or a clanging cymbal. 2 If I have the gift of prophecy, and know all mysteries and all knowledge; and if I have all faith, so as to remove mountains, but don’t have love, I am nothing. 3 If I dole out all my goods to feed the poor, and if I give my body to be burned, but don’t have love, it profits me nothing.